The stamp is featuring the vaisseau "Le CHASSEUR, commanded by Guillaume Dufresne d'Arsel (born in 1668 in Saint-Malo), when he arrived off the island of Mauritius on September 20, 1715, with the silhouette of the Rempart Mountain in the background and white-tailed tropic birds in the sky (an emblematic bird species of the island). 1714 In the third French expedition to Mocha: the Le CHASSEUR under the command of Guillaume Dufresne, sieur of Arsel, and the La PAX under command of Capt. Jean Baptiste Grave de la Mancillien.sail from Saint-Malo on 21 March 1714, when loading at Mocha he received orders from Captain Grangemont of the SUCCÉS officer of the French East India Company to take possession of the Isle of France. After finishing loading a cargo of 1,700 bales of coffee the Le CHASSEUR and Le SUCCÉS under command of Grangemont sailed 29 June 1715 from Mocha bound for Ile de France where both arrived on 26 August 1715. 20 September 1715 after an exploration of the island, to ensure the total abandonment of it by the Dutch in 1710, and making some repair on the vessel, they took possession of the island in the name of the King of France which they named Isle of France, now called Mauritius. 23 September both vessels left the anchorage and via Ile de Bourbon where they disembarked two marooned Dutchmen, who had stayed on the island since the departure of the Dutch from Mauritius. The Le CHASSEUR headed then for France, where she arrived at Saint-Malo on 26 February 1716. She was between 300 and 350 ton. Owned by Hyacinthe Chapdelaine Sieur Laumosne and associates. This voyage she made was for the La Societe des Messieurs de Saint-Malo. There was another Le CHASSEUR around that time, but I do not believe she is the same ship, tonnage and armament are not the same. LE CHASSEUR:…Nominal Guns: 16, Nationality: Royaume de France, Operator: Marine Royale, Purchased: 6.1720, First Commissioned: 8.1720, Shipyard: Unknown, Category: Unrated, Ship Type: Corvette, Sailing Rig: Ship Rigged, Sold: 1722, Dimensions: Burthen 60Ton , Service History: 8.1720 Armed at Martinique. The Official First Day Cover is illustrated with the map of the South - West Indian Ocean which is denominated by the landmass of Madagascar and dotted with the geographical positions of the smaller islands of the six other participants. The cover was offered to the public as an “indelible souvenir” of a “nation building event” that sets “the chord of Mauritianism vibrating” and keeping “alive the patriotic fibre” at Rs 60 .00 per cover. 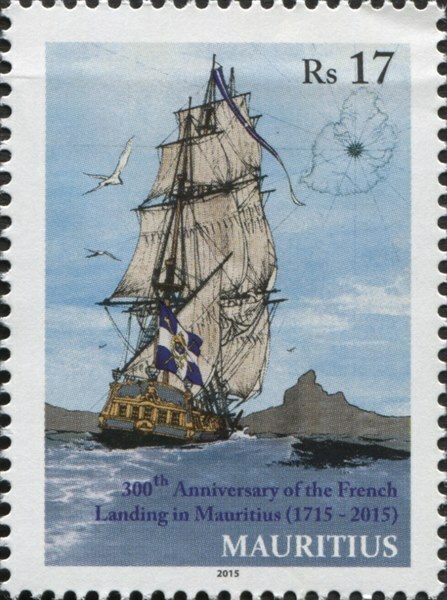 ( reduced ) 300 th Anniversary of the French Landing in Mauritius (1715 - 2015) The tercentenary of the French landing in Mauritius was commemorated by both France and Mauritius with the joint issue of a common postage stamp, drawn by French stamp designer Franck Bonnet, on 25 th September 2015.. The stamp shows “LE CHASSEUR” all sail s unfurled sailing along the west coast of Mauritius with Rempart Mountain dominant in the background. The Official First Day Cover panorama is described as “Illustrated scenery of “ Baie des Moluques” as seen by crew of “ LE CHASSEUR” in 1715 ” . The lush green scenery of the island, the Moka range with Pouce Mountain is fronted by a sandy beach and the turquoise Baie des Moluques – “an imagery of uninhabited Mauritius at the early 18 th century”. The folded data card is of four equal sections. The first section is designated in French “ 300 e Anniversair e du débarquement des Francais à l’Ile Maurice (1715 - 2015) ” , the two inner sections are in English titled “300 th Anniversary ” etc and “Illustrated scenery ” etc . A short story of the landing is of the same narration in both the French and English version s – briefly: Guillaume Dufresne d’Arsel landed on the island on 27 th August 1715, took possession on 20 th September 1715, first settlers arrived from Bourbon (Réunion Island) in December 1721 and from France in April 1722. The French ruled until 1810, the British colonized Mauritius in 1810 and granted Mauritius its independence in 1968. The third section describes the postcard and First Day Cover illustration as the “probable environment in 1715” with the once heavily forested Moka range mountains of palms and ebony forests. The coastal waters with small forested islets where dugongs, dodos, geese and tortoises were once extremely common when the island was uninhabited were already extinct by 1715”. 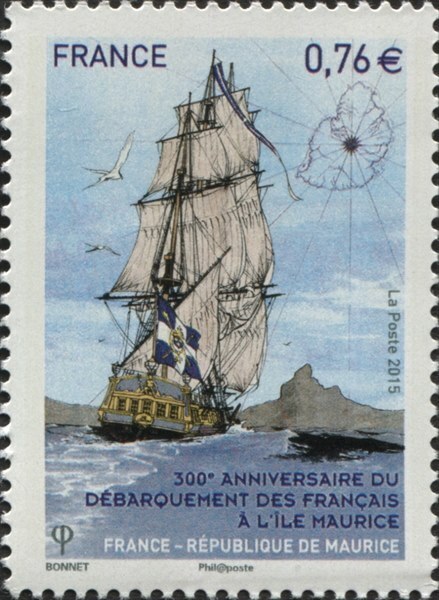 The fourth section contains the technical details of the stamp with an illustration of the ship “LE CHASSEUR”. 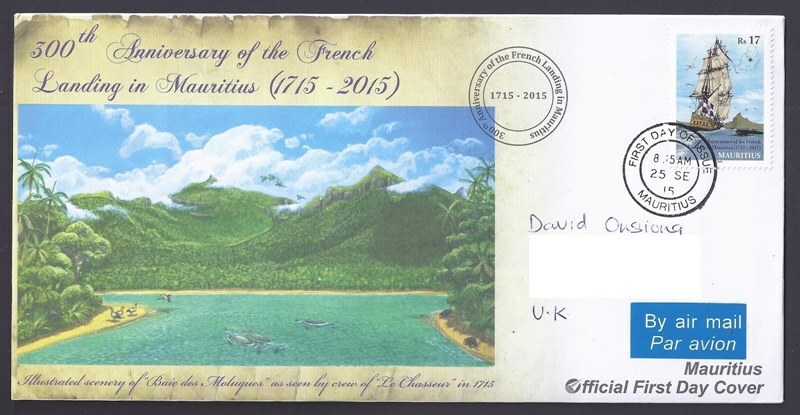 The Official First Day Cover was available at post offices in Mauritius as from 25 th September 2015 at Rs 60.00 per unit. France 2015 0.76 Euro sg?, scott? Mauritius 2015 Rs 17 sg?, scott?